Time and time again on our facebook group everyone keeps repeating the same name Melissa Hill and every time I say no sorry I have never read any books by this author everyone is so shocked. So when I was approached to read and review her new release The Charm Bracelet how could I refuse, it was time I found out what all the hype was about! Holly works in a vintage dress store which relies on donations but one day whilst sorting through a donation box she feels something in the jacket which has been donated and she soon comes across a beautiful charm bracelet. Holly has a charm bracelet of her own which has a number of charms on it each one symbolising a moment in her life and as she carefully looks at the charm bracelet she has found she feels that this charm bracelet also has a story to tell. Holly finds herself on a complicated mission to return the bracelet to its rightful owner as she tries to unravel the clues that each charm presents. Greg decides to pack in his job and follow his dream of becoming a photographer but unfortunately his excitement of the start of his new career is short lived when he breaks the news to his partner Karen who is less than pleased at his decision. This really is an amazing book. The author creates such a perfect main character in Holly who, juggling work with bringing up her son alone, felt like a very down to earth and believable character. I really felt that the heart strings were being pulled in this book especially when the book changes to the owner of the bracelet telling her story I was on the edge of letting out a little sob as it was so moving. 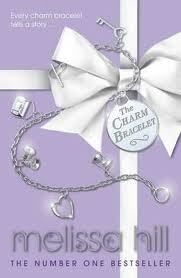 I love the mystery that the author creates around the charm bracelet I had no idea until about half way through the book how the characters would all come together and how the story would end. Each charm had its own little story and I loved finding out the story behind each one it gave a real feel good factor to the story. I love Melissa Hill’s style of writing the descriptive writing she uses surrounding New York makes me feel as if I have just been shown pictures of the places she mentioned rather than reading it from a fictional book. She has a very easy writing style which made the book easy to read so I did find myself working my way through the story pretty quickly but without the book feeling rushed. I loved the way that the ending felt like a modern day fairytale it seemed to bring the ending to a prefect finish. I can not recommend this book enough, I am sure this is one that you will all want on your To Be Read piles. I will definitely be hunting out more books by this author I have definitely been missing out. A perfect little package which will pull at those heart strings. This sounds like my perfect read! I've got a charm bracelet that I add to to mark special occasions :) Might have to treat myself to a copy this weekend!